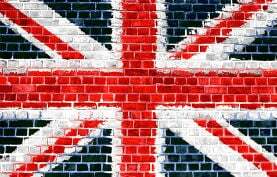 Five years ago, copyright industry groups and Internet providers teamed up to fight online piracy in the UK. Backed by the Government, they launched several educational campaigns under the “Get it Right” banner. Under the program, ISPs send out piracy warnings to subscribers whose accounts are used to share copyright-infringing material. This campaign started two years ago and has been ongoing since. While the piracy alerts received plenty of news coverage early on, there haven’t been any official updates since. While we and other journalists have requested information on the scope and effectiveness of the campaign, the parties involved have remained quiet. The silence was broken this week when Ian Moss, Director of Public Affairs at music group BPI, spoke at an anti-piracy conference in France which was live-streamed to the public. In his presentation, Moss discussed some preliminary results on the effectiveness of the UK alerts. According to Moss, ISPs have sent out roughly a million piracy alerts since the campaign launched. This translates to half a million emails per year, which is a rather significant number. Users who receive these piracy alerts are sent to a dedicated portal where they can read more information on how to prevent further alerts in the future. These emails and portal do their job, Moss said, noting that less than 1% of the recipients call for further information. The BPI also showed some early evidence which suggests that people who received the alerts are less likely to pirate. However, Moss stressed that these are preliminary findings which come with some caveats. 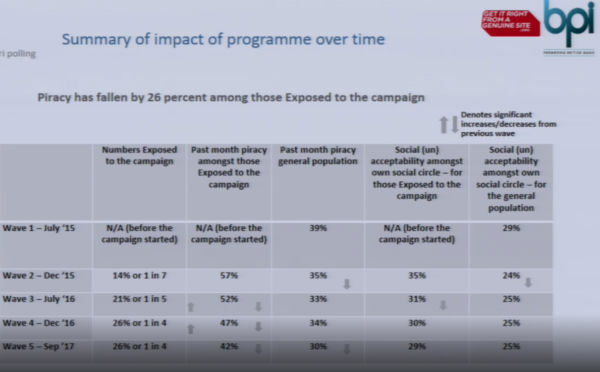 The slide that was shown to the audience suggests that the “Get it Right” campaign, in general, led to a 26% reduction in piracy, compared to a control group of people who weren’t exposed to the campaign. Since these data go back to 2015, they refer to the broader educational campaign as well, as the email alerts didn’t start until 2017. Based on the slide, piracy rates among the ‘exposed’ group dropped from 57% to 42% in three years. While these data aren’t ready for official publication yet, the early preview suggests that the broader “Get it Right” campaign, which also includes educational videos and social media outreach, have a positive effect. BPI’s Director of Public Affairs noted that about one in four members of the public has seen their messaging by now, which is a pretty significant number. According to the music group, official data and other figures will follow later. With a fresh £2 million in funding from the UK Government, the campaign is guaranteed to continue until 2021. By then, we hope that the responsible parties will also release their findings through the official channels. Effective or not, the alert emails are definitely not a silver bullet since they only address BitTorrent piracy. While that was the main threat years ago, the music and movie industries are more concerned about stream-ripping and pirate boxes nowadays.